High pressure: 4.0 kg/cm sq. Item Size: Dia - 4.5" x H - 8.25"
Derling Clamps or Curtain clamps are useful for mannual rolling un-rolling if green house aside curtains. These are made from UV resistant plastic material. Are available for 1/2 inch and 3/4 inch diameter pipes. Recommended for orchards and green/glass houses requiring fine mist spray for temperature and humidity control.Suitable for crops require to maintain micro climate in the canopy area. 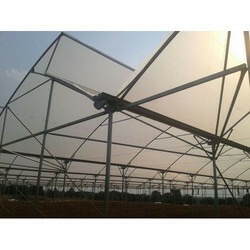 We are manufacturing, supplying and exporting of Greenhouse Shade Net. 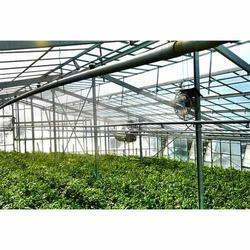 Greenhouses equipments and accessories includes: Automation & Fertigation bench(with mobile control software), Irrigation Systems, Dosing Pumps, Trellising, Growing System, Growing media, planting material, etc. ), according to your customized requirement. We are a trusted name in the domain of supplying, wholesaling Greenhouse Shading. Leveraging on the skills of our professionals, we are involved in offering best quality of Plastic Fogger Brass Plastic. We have emerged as one of the top most name in the industry for our extensive range of Plastic Fogger Brass Plastic. This Plastic Fogger Brass Plastic is highly acclaimed due to its effective results. Green House Equipments - Made out of galvanised steel tubes, mesh, to accmodate trays, direct pots, excellent load bearing , convenient .ideal for effective utilisation of greenhouse areas. It reduces temperature up to 15°C in the poultry shed during peak summers. We are one of the leading MANUFACTURERS AND SUPPLIERS of Poultry Plastic Fogger that are made using best quality material obtained from well known vendors in market.